After struggling at the last round in Jerez, Yamaha has found a good groove at Le Mans and taken the top three qualifying positions for tomorrow’s race. 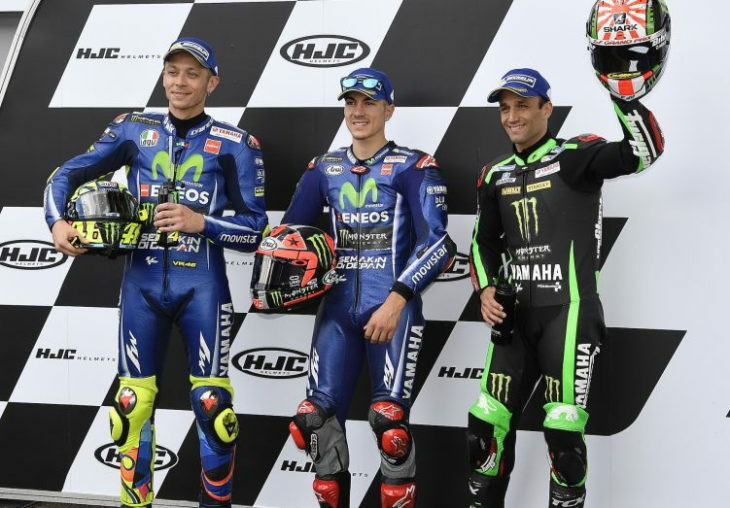 Starting on pole will be Maverick Viñales, with teammate Valentino Rossi qualifying second and rookie Johann Zarco qualifying third. Some fast riders were caught in Q1 and will start near the back of the grid, including Dani Pedrosa (Honda) and Jorge Lorenzo (Ducati). Follow this link to the full qualifying results. Maybe it’s because I’ve been drinking, but I think Vale needs to grow his hair out again. Say it’s a tribute to Simoncelli. to kinda put the irony of Nicky’s accident into perspective, you gents may want to look up the video of Jack Miller’s practice crash into the wall this weekend at Lemans and in car world Sebastien Bourdais’ qualifying crash into the wall at Indianapolis, both are absolutely horrifying while eerily similar for being different disciplines of motorsport. That was an exciting Q1 and Q2 for a change. Zarco did not disappoint the home crowd. KTM puts both bikes in the top-10, besting a Repsol Honda, a Tech3 Yamaha, both Suzuki’s, and a factory Ducati or 2.. Impressive. They have to be real happy about that. Quite a different bike now that it’s running the big bang engine.